Product Benefitts LED based retrofitt lamp with E27 Fittting suitable for all sort of professional and in home applications. 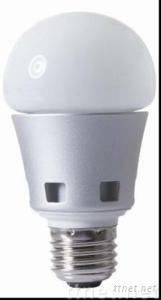 Replaces CFL and incandescent. - Warm, pleasant white light - Energy eficient - High light output - Lasts up to 20 times longer than Incandescent - Does not contain mercury - Suitable for usage in the living-room, Bedroom, kitchen, hotels, restaurants, etc.